Yangon, Myanmar -- Allow me to discuss with the reader the subject of the Buddha and His views on politics. Being a Buddhist monk, I will try to illuminate you on the right way of life and the best kind of political involvement, according to the Buddha's teaching. 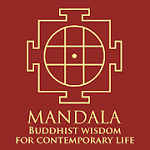 These teachings are not only for Buddhists, but also for all non-Buddhists. It is for everyone. << Monk politics: A monk holding an upside down bowl. 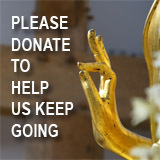 An act of refusal to accept donation by the military, which is the supreme "offense" for a buddhist. What does being “Buddhist” mean? The best answer is that those who are practicing and living in accordance with the Buddha's teachings are called Buddhists, because practice is much appreciated by the Buddha. Then, what are the teachings of the Buddha? The rudimentary and shortest answer is that we must always endeavor to do good and practice kindness, rather than doing evil and harm to others. Obviously, no one could ever conclude that the current rulers of Myanmar are Buddhists. 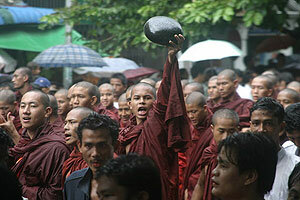 They have attached themselves in name only, to affiliate with Buddhism in order to rule the country. They "try" to become Buddhists without knowing any teachings of the Buddha. These generals are surviving truly on ignorance and blind faith, for true Buddhists must first be a self-learner and must continually practice to achieve the highest liberation (nirvana). Politics and political matters in Buddhism are considered worldly concerns, yes. But the Buddha did not ignore such worldly concerns, because as a Prince estranged and removed from his prior worldly concerns, He was still living in society. Alms food comes from vast numbers of people constituting society. So should we not work to elevate society to evolve into a higher form, to be more effective and more just? The monks were also told by the Buddha to work for the good of many, for the benefit of all beings and for the betterment of society. The intent behind the founding of the community of monks (Sangha in Pali, Pali being the original language of the Buddha) was entirely to benefit the people. In the life of Buddha, we find that the Buddha often discussed politics with the rulers of realms in his time, such as King Mala, King Kosala , King Licchavi and King Ajatasattu . The Buddha always preached to the Kings, that they must rule their kingdoms with dasarajadhamma. He showed how countries could become corrupt, degenerate and unhappy when the head of the government becomes corrupt and unjust. He spoke against corruption and how all governments’ actions must be based on humanitarian principles. Clearly, religion and politics are something analogous to paper money having two sides. The front can be regarded as religion and the other side can be regarded as politics. They cannot be separated from each other. Otherwise the value of money is nothing. Similarly, Buddhist monks and other religious leaders also should not be separated from politics. I don’t mean to imply that they should rule the country, but just to present and to advance their Buddhist precepts throughout the workings of a government in order to prevent so many wars and conquests, persecutions, such egregious atrocities, rebellions, and the destruction of works of art and culture. Perhaps Thailand and Sri Lanka can be looked at and considered an example of a successful but not perfect Buddhist Nation. Myanmar has a long way to go in this regard, and the Burmese Generals, if they were smart and wanted to survive as a government, would work at a rapprochement with the Buddhist leaders, who have always had the support and good will of the vast majority of Burmese people, rather than crushing them, infiltrating them, jailing them, beating them, killing them, and otherwise persecuting the Buddhist Monks of Myanmar.